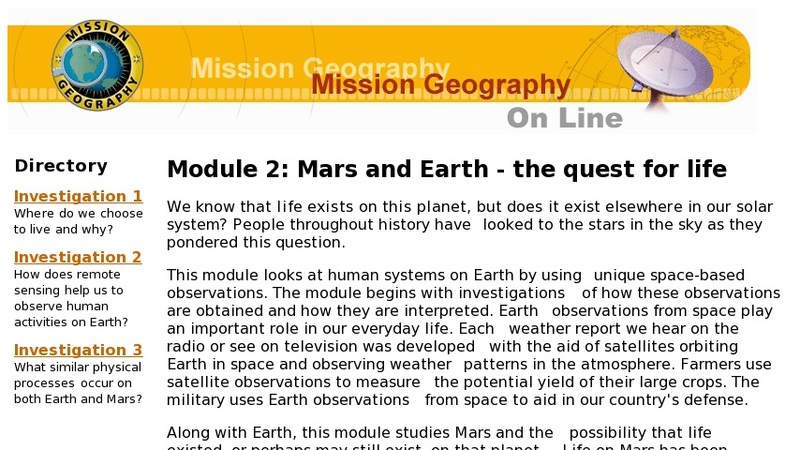 Mission Geography uses existing NASA data and images where possible to engage students in active, hands-on inquiry, modeling the scientific method and developing students; understanding of environment-society relations and earth science. This module begins with investigations of how observations are obtained and interpreted. Earth observations from space play an important role in weather reports, the potential yield of large crops and military use to aid in our country's defense. Along with Earth, this module studies Mars and the possibility that life existed, or perhaps may still exist, on that planet, an idea that has been debated since the late 1800's. The comparison of Earth and Mars is accomplished by identifying and observing similar physical processes that exist on both worlds. Each investigation is complete with overview, a list of materials and supplies, content preview, classroom procedures, worksheets, background, and evaluation.